2010 NFL Football Playoff Predictions: Close But No Cigar: I have split the 32 NFL football teams into three groups. The first group is the 12 teams that made the NFL Predictions Playoffs. The second two groups I call the "Close" (ten teams that almost made the Playoffs), And the third group is named the "No Cigar" ( teams that had no chance to make the 2010 NFL playoffs). It doesn't take a rocket scientist to figure out that if your NFL football team doesn't make the NFL playoffs, they will not be a NFL Predictions 2011 winner. Rarely, will a team jump two notches from the "No Cigar" to become a NFL playoff team. Out of the 10 NFL football teams from that group, I think The Oakland Raiders and the Washington Redskins have the best chance. That presents great NFL Predictions and NFL betting opportunities in the NFL picks regular season, wagers as well as great profits if you pick a team to be the upset winner in their division. In NFL football it's all about the quarterback, and both Washington and Oakland has improved that position. Ironically, one with the others ex quarterback. Of the ten NFL football teams that were "Close" to making the NFL playoffs, Miami, Tennessee, and Houston of the AFC appears to be the teams to make the moves up. in the NFC, the San Francisco 49'ers are the bettors and NFL odds makers choice to make the leap. I still don't trust quarterback Alex Smith. The New York Giants, Chicago Bears, and the Atlanta Falcons are the NFC's best choices to return to the promised land. Room at the Top? For every new NFL football team that makes the NFL Predictions Playoffs, there is a team that won't, it's called the law of displacement. In the AFC one must figure out which second and third place teams will trade spots and will their NFL Prediction regular season records be good enough to grab the AFL's two wild card spots. Darrelle Revis, Ocho Cinco, and two ex-USC quaterbacks could play key roles. Of Last years NFL Predictions playoff teams Arizona, Philadelphia, and Minnesota all have questions concerning their, guess what?, quarterbacks. 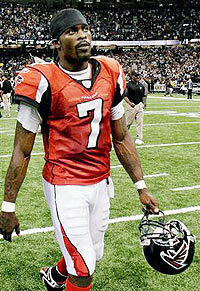 Maybe we will see the re-emerging of Michael Vick. In any event you must consider... Close or No Cigar?